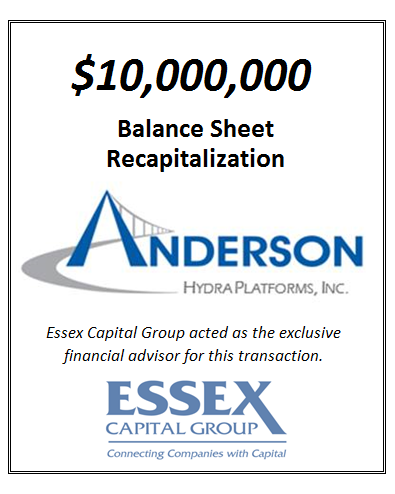 Essex Capital Group, Inc. (“Essex”), announced today that the firm recently arranged a $10,000,000 term debt capital raise for Anderson Hydra Platforms, Inc. and Anderson Crane & Bridge Technologies, Inc. (“Anderson” or the “Company”), affiliated companies in the business of manufacturing, selling and leasing under-bridge access platform cranes (http://www.inspectabridge.com). A deteriorating infrastructure system in the United States has led to rapid growth in demand for Anderson’s cranes that allow for under bridge repairs. This recapitalization allowed the Company to consolidate numerous debt facilities while providing additional capital to further invest in fixed assets. At the same time, Anderson’s monthly debt service was reduced by approximately 50%.